A tiger is a large, solitary cat, one renowned for its fierceness and raw power. Given such noble and strong qualities, it is no surprise, perhaps, that tigers have appeared frequently throughout cult-TV history. 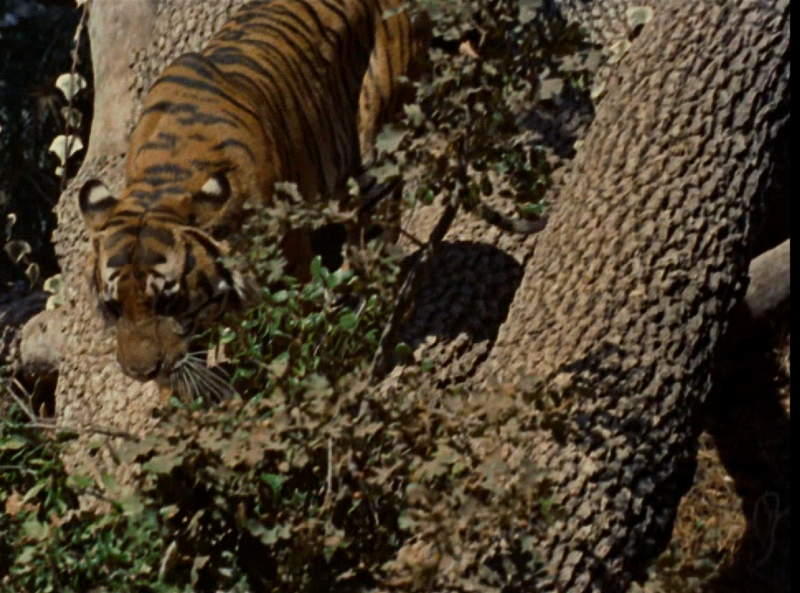 In the original Star Trek (1966-1969), for example, a tiger appeared in the early first season episode "Shore Leave." 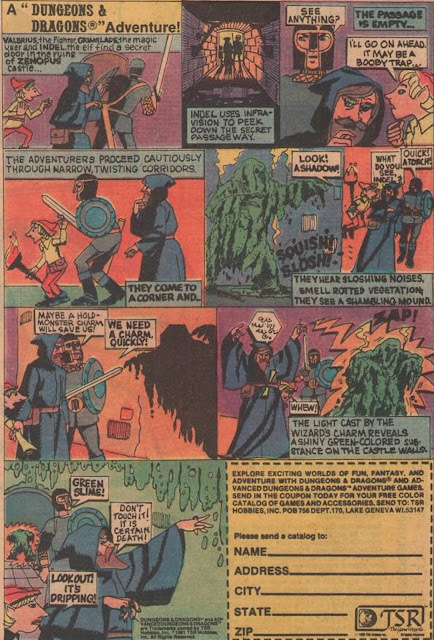 As you may recall, this episode concerned an amusement park planet where the "wishes" of every crew member become reality. 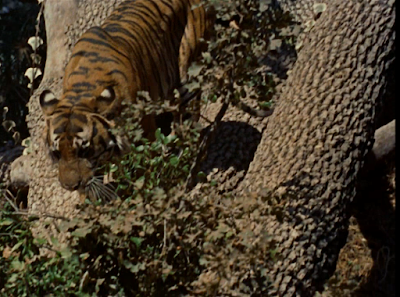 Late in the episode -- while Captain Kirk (William Shatner) is grappling with an old tormentor named Finnegan and an old flame named Ruth -- he must also deal with a loose, Bengal tiger. According to legend (which may be apocryphal...), William Shatner thought Kirk should wrestle the tiger, until someone talked him out of it. The same year, Batman (1966-1968) featured a two-part episode called "The Purr-Fect Crime/Better Luck Next Time" featuring Julie Newmar's Catwoman. 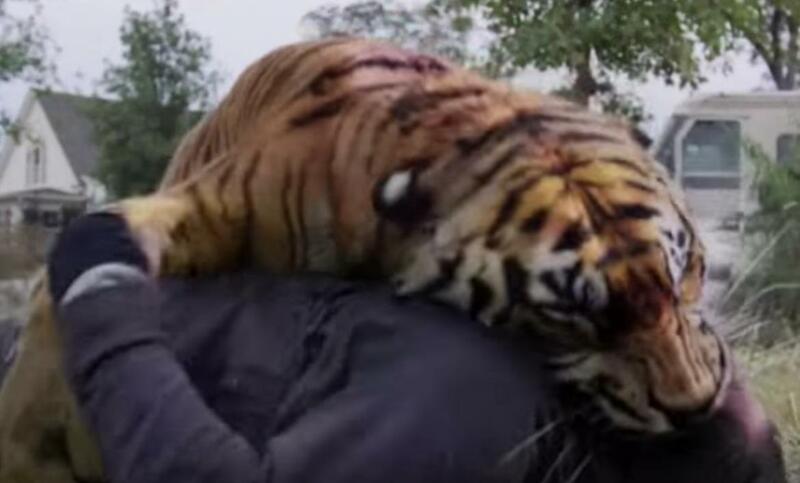 There, Batman was forced to contend with her pet, a tiger. 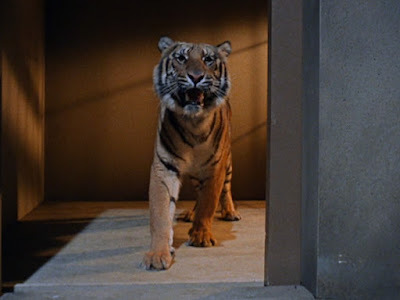 A few years back, a tiger was also seen in Hannibal (2013 - 2015). The third and final season of this gripping series was an adaptation of the Thomas Harris novel Red Dragon, and involved a serial killer, Francis Dollarhyde (Richard Armitage). This "Tooth Fairy" killer developed a romantic relationship with a blind woman, Reba (Rutina Wesley), and at one point took her to visit a sedated tiger at the zoo. There, Reba was able to put her head to the tiger's chest, and feel the powerful animal's breathing. 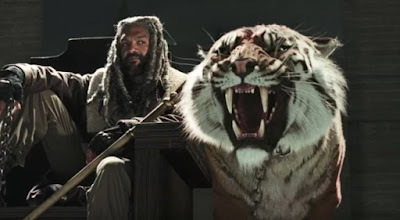 The most celebrated of recent cult-TV tigers is no doubt Shiva, the constant companion of King Ezekiel (Khary Payton), on AMC's The Walking Dead (2010 - ). Ezekiel goes nowhere without Shiva, and rules the Kingdom from his throne, with the tiger at his side. In the season seven finale, viewers see the more aggressive side of not-quite-domesticated Shiva. She launches an attack on Negan's minions at Alexandria. Finally, tigers play an important role in Carnival Magic (1981), a bizarre "experiment" on Mystery Science Theater 3000: The Return (2017 - ).